Bacterial wilt (Xanthomonas campestris) is a bacterial pathogen. 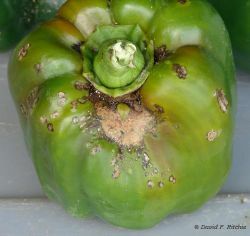 Xanthomonas campestris is an aerobic, Gram-negative rod known to cause the black rot in crucifers by darkening the vascular tissues. Host associated, over 20 different pathovars of X. campestris have been identified by their distinctive pathogenicity on a wide range of plants including crops and wild plants.